Do you know someone who has a taste for Mexican? Perhaps they like to have a Corona every now and then. This is a great product that has the style and branding of the famous Corona bottle, but the ease of use and re-usability of an ordinary glass. Even better, the glasses are made from recycled bottles so you're helping the environment as well. Each set comes with four glasses. 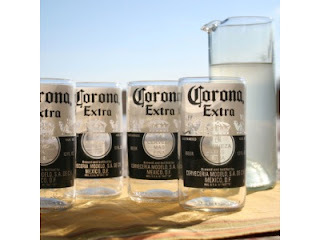 Purchase this set of four Corona glasses from Packed Full of Love's Internet Gift Shop. This is the perfect gift for the Corona loving person why prefers to enjoy their drinks from a glass rather than a bottle. The Corona Glasses featured here are another gift from the new Aussie Online Gift Shop - Packed Full of Love. They specialise in gifts given with love to friends and family. If these glasses don't take your fancy, why not check out the rest of Packed Full of Love's collection.